Hello there and thank you for stopping by to celebrate Altenew September Release – there are new coordinating dies, several new colors of ink, reinkers and glitter tapes (more about the hop and new products below). 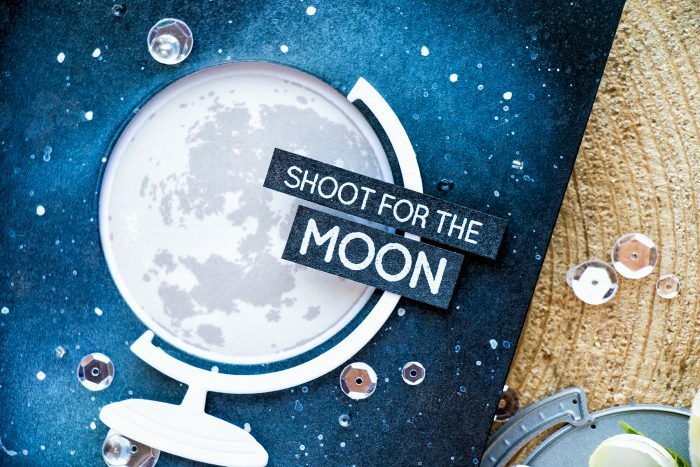 I have a window card to share today combining a few products – a new coordinating die set for the Big World stamp set and the Shoot For The Moon stamp set. The first thing I wanted to do when I got the new globe dies is try and fit the moon inside the globe for an uncommon look. Love the way this turned out, but you can also stamp the Earth in the same manner. The card base for my card was made out of black cardstock and I followed this tutorial I shared a few weeks ago for an easy ink blended galaxy background. Saves a lot of time and makes easier on the wrist. I also sprayed Distress Mica Spray over my background to add shimmer and stars, added drops of white watercolor and drew in some white stars using a white Uni-Ball gel pen (I was looking for a good white pen for a long time and this one is fantastic). 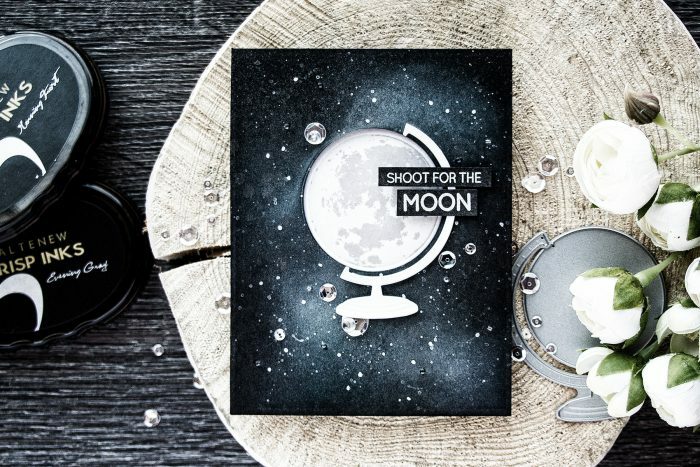 The moon was stamped using two light gray ink colors from Altenew – Morning Frost and Evening Gray; I stamped it onto a piece of white cardstock cut to 4 x 5 1/2″ and adhered inside my black card. 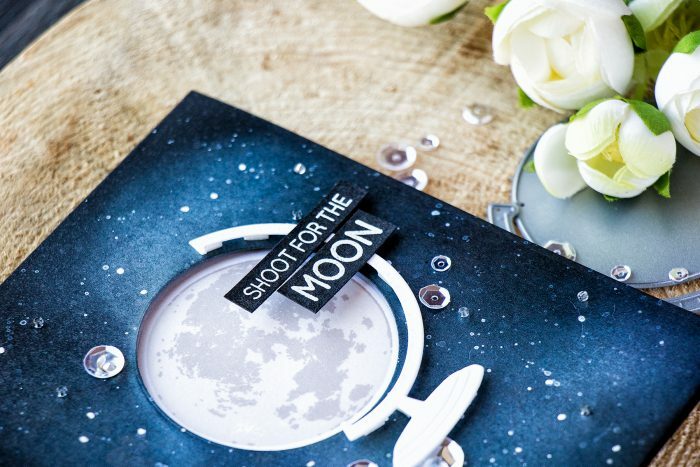 The sentiment, Shoot For The Moon, was heat embossed in white embossing powder onto black cardstock that was also sprayed with Mica spray and looks shimmery. 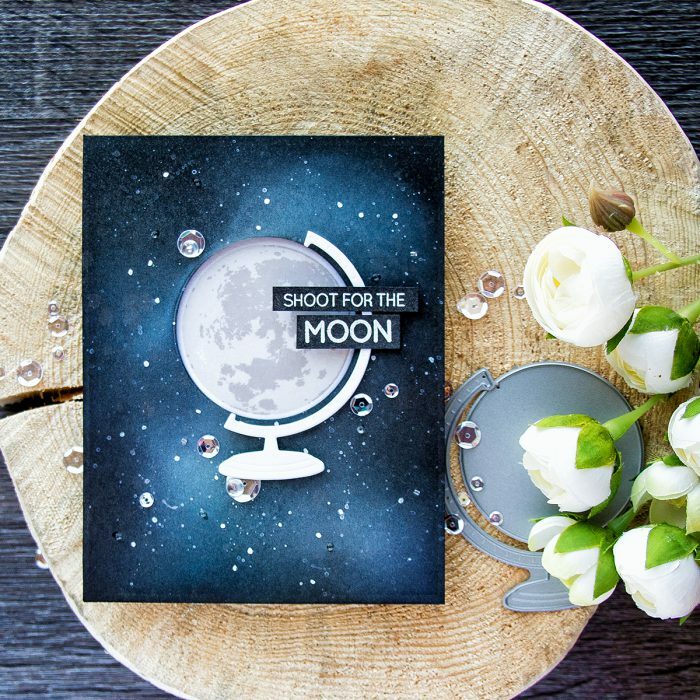 Window opening was made using the circle die from the Big World die set, it is perfect in size to accommodate the moon from the Shoot for the Moon set, and the globe stand was cut out of white and foam mounted for a pop of dimension. I also added several sparkling clear sequins, drops and beads to finish the background and create some additional celestial bodies in the sky. I wondered what this project would look like had I made the colors darker and used no blue, so I changed it to black in white in my photo editing software and I really loved this look. Might make a card in these colors later. You can also win a $30 gift certificate by leaving a comment on my blog! Let me know which new product you are most excited about. I’ll announce the winner on my blog (here in this blog post) by Saturday, September 24th. I’ll e-mail the winner, too. The winner is: papertokens. Congratulations! If you arrived from Aimee Dow, you are on the right track! The next stop on this hop is Evelyn Yusuf. If you got lost or would like to start over, please go to Altenew Blog. So beautiful! Love the beautiful backgrounds! I already told you how much I love this! Absolutely brilliant! Wow! The card really pops with the colors you used. This is one heck of an amazing card! You go girl! Such a cool window card! That background looks amazing! 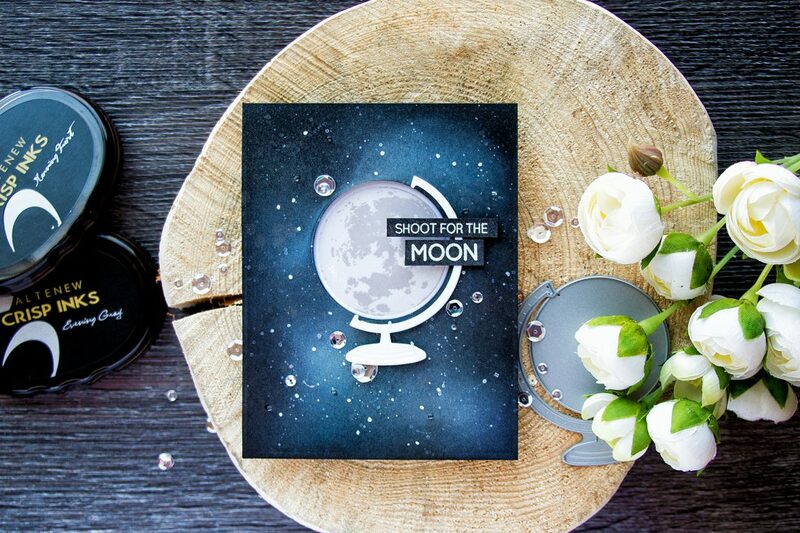 What a clever card – love the stunning dark blue color and the window for the moon. My favorite is the lagoon ink pad , love this color ! Beautiful cards, Yana. Wonderful background. Love these new inks. What a fantastic design Yana, love that incredible background you created!